Very picky about shoes and don't have deep pockets either? No worries! Metro Plaza has an entire floor dedicated to shoes and sandals starting at just INR100. Grab those petite ballies in metallic shades or go for the classic ones with satin bows (INR 200 - 400). If monsoon is a problem, then look out for those slide slippers in solids and with the sun winking icon. You can also opt from a wide variety of basic slippers or go for some jelly platform open toe sandals starting at INR 200. Studs are in season and they can be found on ballerinas, sneakers, sliders and flats. The aqua green embellished open toe flats are show stoppers priced at INR 350 only! They come in shades of beige, black, aqua blue and aqua green. You can find them at FI Footwear (shop no. 3006). The flat sandals with braided straps priced at INR 250 were another great find. They come in subtle hues of grey, dark blue, beige and black, perfect for not-such-a rainy-day and blends well with an ankle length skirt or a mini dress. Forever a fan of sneakers? There are tons of options and a crazy variety to choose from. Starting with hottest trend of the year - white sneakers (from INR 350 to 700, but bargain a bit). 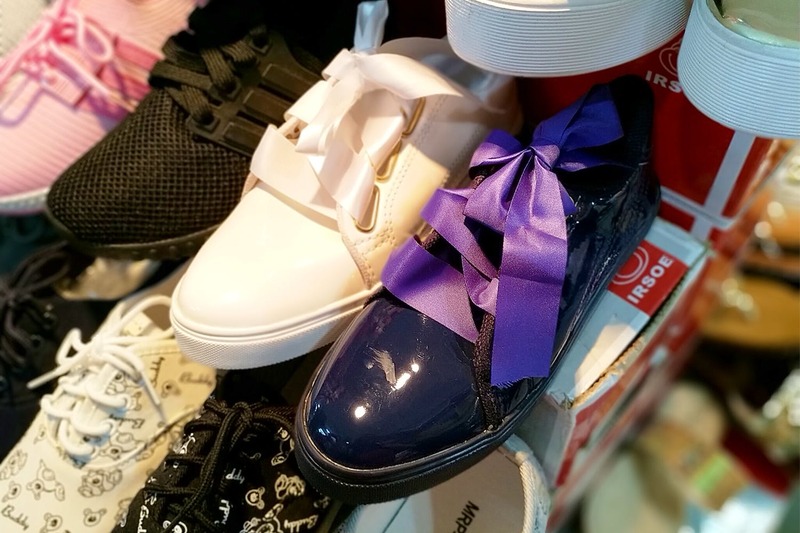 Engraved glitter shoes and glossy casual shoes with ribbon tie-ups are the next gen of sneakers. You can find them in almost every shop here. If you don't find your size, do not worry, try the next shop. If you're more into desi designs,Way 2 Walk specialises in Kolhapuris, starting at INR 200. Carry cash, as most of these shops don't accept cards or Paytm.